What’s a marriage without some ups and downs? Those of us with more than a few years of wedded bliss know that even happy marriages have their own challenges. We’ve been through depression, anxiety attacks, a near-fatal birth, and a rebellious teen. No, life has not always been smooth sailing. 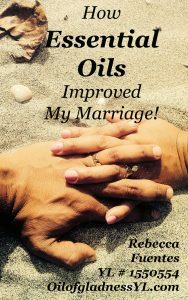 I am happy to say that essential oils solved a chronic problem plaguing our marriage. It had to do with sleep–specifically, the lack of sleep. Remember being in high school or college and thinking, “Ha, four hours a night every night for a month is totally doable! I can hack it.” I even had a friend in college who self-experimented with not sleeping at all. You may not be surprised to learn that it went poorly. In our driven society, sleep moves further and further down the priority list. That’s bad, because we need sleep. Lack of restful sleep is major stress on the body, and chronic lack of sleep leads to numerous health risks, from weight gain to heart disease. It can severely affect driving and job performance, and impairs our judgement. Two chronically sleep deprived people trying to work, parent and love each other makes for rough marital times. My husband snored some when we married, but it grew increasingly worse as he battled depression and anxiety attacks. He was also an incredibly restless sleeper. I increasingly retreated to our couch or recliner to escape the noise of his irregular snores and the jarring movement of his restlessness. He woke in the morning just as exhausted as he was at bedtime. The couch wasn’t super-comfy, so I woke up sore and grouchy. I hated being driven out of my own bed, and I was not gracious about it, either. It was a strain on our marriage. Doctors put him on a breathing machine at night. It eliminated the snoring and the restlessness. Unfortunately, it also meant he was tethered to his side of the bed. I couldn’t touch him, because in my sleep, I might tangle, loosen or disconnect his tubing. We were sleeping better, but the sweet bedtime conversations and cuddles were no more. If he forgot his machine, I ended up back on the couch. It seemed like a choice between intimacy and sleep. We needed and wanted both. After the birth of our fourth baby (Curlytop), I finally made time to attend an essential oil class. Four children under seven will make anyone tired. We were both feeling the effects of parental exhaustion and the lack of intimacy caused by the machine. When my friend explained how certain oils support relaxation and restful, peaceful sleep, I was ready to try. If it worked, we would gain back our marriage bed. If it didn’t, we wouldn’t be any worse off. I was skeptical, but I also decided that peaceful sleep couldn’t be caused by the placebo effect either. I would put Young Living Essential Oils to the test. It went much better than my friend’s experiment in college. My husband’s sleep became increasingly calm and peaceful. He woke up rested even without his machine. His loud, erratic snoring became quieter, regular and disappeared completely unless he was stuffy. He no longer shook the bed with his tossing and turning. Best of all, he was no longer tied to his side of bed. We could fall asleep in each other’s arms again. I had wanted to know if essential oils were more than hype and smells. The answer was yes, and an answer to many prayers as well. Until then, I hadn’t known how much I missed snuggling up to him as we drifted off to sleep. It had been nearly ten years since we’d been able to. 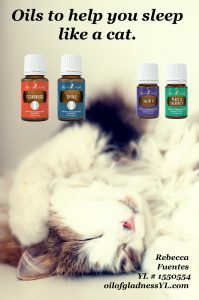 Every night, we apply two oil blends and two single oils to the tip and bottom of his big toes. We’ve experimented with applying them on his temples and on the back of his neck, but the toes work best. We start with Young Living‘s Peace & Calming II blend, followed by their Valor II blend. Then I use thyme oil and cedarwood. Cedarwood was the last oil I added to our routine, several months after using the other three. He remarked, after using cedarwood the first few nights, that he was dreaming again. For most of a decade, he could not remember dreaming. Now he did. Can essential oils save a broken marriage? Maybe not. They can certainly improve a marriage by eliminating a source of stress. They can help both spouses be their best by supporting healthy, relaxing sleep. Essential oils can smooth the rough edges caused by stress and strain. What solutions could essential oils hold for you?